So you feel like some sci-fi, but you want some romance, but you also feel like some comedy. What to do? No sweat, IS: Infinite Stratos is here to save you from your dilemma. The anime is your harem comedy anime with some nice sci-fi action situated in a futuristic society. If you want a typical sci-fi anime full of action, then I would say that you should look elsewhere. Infinite Stratos is what you would call a complete silly sci-fi comedy anime with harem elements thrown in. If you just want some hilarious awkward and embarrassing moments, then this anime should definitely suffice. That said, the story is quite linear and easy to understand even with all the technical jargon mixed in. Simply put, the story is about a boy that accidentally touches an IS and is able to operate it. He is suddenly put into the special IS training school along with many other girls and thus his interesting life surrounded by girls begin. Typically, it is a harem so expect some sappy shoujo moments and embarrassing complications. For a sci-fi anime, the story never leaves the training school and you will see most of the episodes held within the school grounds. The ending though, takes a different turn and you will be presented with some nice fan service action and a final plot twist. Story-wise, it was pretty linear and straightforward to understand. The art was excellently illustrated and animated. The characters all looked extremely cute and captivating. The IS looked decent and had enough variety in weapons and types to keep you entertained. Of course though, most of the time you will be staring at the characters because they are just too damn appealing. Anyway, the quality of the art was really good and had fine detail in characters and backgrounds. The voice acting was perfect for most of the characters. As expected from a harem-type anime, the girls would all sound pretty similar and it took some time to distinguished between all the high-pitched voices. Although in the end I was able to tell apart some characters due to the use of some famous voice actresses. The theme songs were your standard pop tune with some catchy beats to it. As for sound effects and ambient sounds, they were relatively decently recorded. The anime presents itself as a sci-fi romantic comedy anime with some slice of life elements thrown in so expect a huge crowd of girls swarming the screen. If course though, the animators made extra effort to present the characters as appealing as possible without turning this into a total girl fetish. Ichika was a pretty decent characters to like. I felt his personality and responses were well define within "acceptable" range. He does not take advantage of others, become a jerk, or ignore the girl's feelings. In other word, he is nice but a bit of an airhead. As for all the other girls, you have your childhood friend that doesn't want to admit her love for him, a newly arrival rival, a tsundere girl and much more. There's a variety here to choose from, so if you are a shoujo anime, moe character fan, you will spend no-time in finding your favourite. Overall, the story was pretty linear and weak to the end. There were some nice fan service action battles here and there. There were also some nice sci-fi elements here and there to satisfy your mecha hunger. 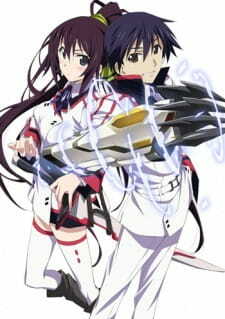 In the end, my opinion of Infinite Stratos is more classified as a slice of life romantic comedy anime rather than a sci-fi anime. Of course though, this anime is evidently directed at the moe-loving otaku group. If you are not one, you probably won't enjoy this as much. Not a strong story to begin with but the comedy and cuteness just makes up for it! Well animated and illustrated, The characters all looked extremely moe and appealing. Voice acting was pretty decent for all characters. Theme songs were your typical pop tune. Cute characters everywhere! Other than that, the characters had limited background story to them. Well, if you like comedy anime featuring a whole bunch of girls and one guy, then you will enjoy this anime. If not, then don't bother watching. I expected this to be more comedy harem than sci-fi action and I was right. How you enjoy this anime depends on how much of a moe otaku you are.